Malagasy villagers have agreed to replant mangroves to restore their activity and especially to fight against the consequences of climate change. The reforestation programme implemented between January and April 2018 is supported by WWF (World Wide Fund), an environmental NGO. Crab fishers have had their work cut out for them in recent years because of rising water levels, which are closely linked to climate change. So they gladly took part in a two-day reforestation campaign in Amboanio (located in the MELAKI region, west of Madagascar) under the leadership of WWF. They firmly believe that their action will bear fruit because “mangroves protect against climate change and sea level rise,” explains Clément Joseph Rabenandrasana, a fisherman from the region. The Melaki region has nearly 50,000 hectares of mangroves, some of which are threatened. “We became aware of the importance of this ecosystem very late,” explains Eric Ramanitra of WWF. This programme will thus make it possible to preserve the mangrove, which was about to disappear (because of global warming and illegal cutting of tree trunks) while improving the living conditions of fishermen whose incomes oscillate between 50 and 80 euros per month. 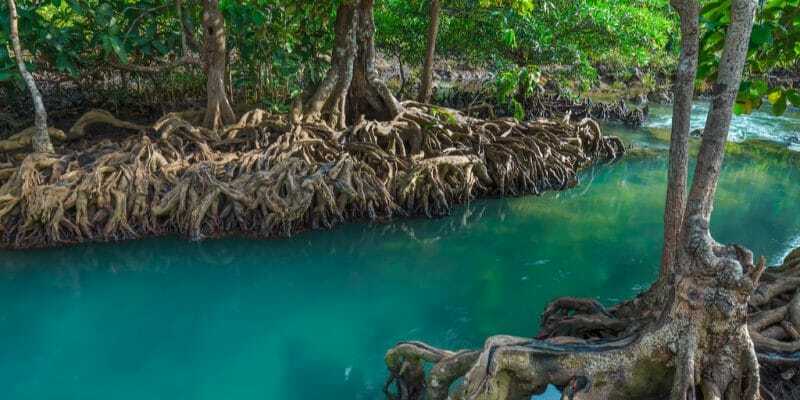 “Mangroves are threatened by rising sea levels and silting from the headwaters of rivers, which disrupts the fragile balance between fresh and salt water that mangroves need to thrive. With the death of the trees, erosion gnaws at the banks, charging the rivers with a red silt visible even into the sea,” report our colleagues from France Info TV. This is an uncomfortable situation for the island, which is among the 15 countries most affected by the climate events that occurred between 1997 and 2016 (according to the Germanwatch NGO). Mangroves play a paramount role in preserving the environment. They can reduce the force of waves in the event of a cyclone, thus protecting villages. They are great carbon sinks. And they also serve as nurseries for fish, crabs and shrimp (“pink gold” from Madagascar) and are home to endemic animals such as the Madagascar eagle, a raptor. Madagascar is the second African country with the most mangroves, behind Nigeria. The country has 4 associated reserves, for nearly 325,560 hectares of mangroves spread throughout the country.